Hi Everyone, Here’s the next seven episodes of “Marvelous Mike”, 3-17-1956, then 3-19 to 3-24-1956. 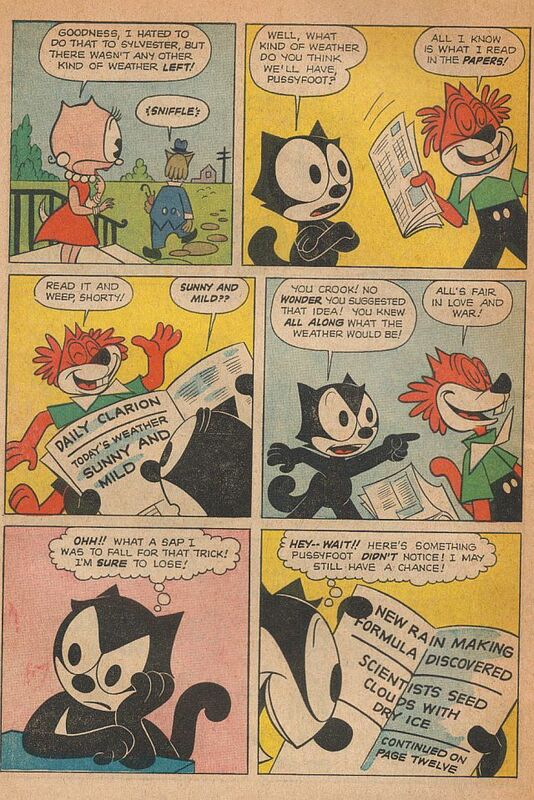 These vary in quality, but I think can be deciphered by most lovers of comic newsprint. These strips are indicative of the Madison Ave. era of the 1950s, when jingles and catchy ad slogans were too much with us. It’s interesting that Mike’s Dad’s boss is “Mr. Kimball”. Perhaps Bob Kuwahara knew Ward Kimball when he worked at Disney’s in the 1930s. At this point in the strip, Mike never speaks in the presence of the adult characters in the strip. This device appealed to me greatly in 1956. Bob Clampett used the same device in the early years of the “Time For Beany” puppet show, by keeping Cecil the Sea Serpent from meeting Captain Huffnpuff. The Captain thought that Cecil was purely a Serpent of Beany’s imagination. Of course, this couldn’t be sustained forever, not in “Time For Beany”, nor, as we shall see, in “Marvelous Mike”. Also in the comics this week are the next two pages of the Jim Tyer Felix story begun last week: “Fair Weather Enemies”. Through the kindness of my friend Vincent Davis, I received a copy of the new biography of Charles Schulz, Schulz and Peanuts: A Biography by David Michaelis. It took nearly two months for me to finish reading it, and I did not read through all the “Source Notes” at the end of the book. Do you see the drawing of Snoopy above that is signed by Charles Schulz? 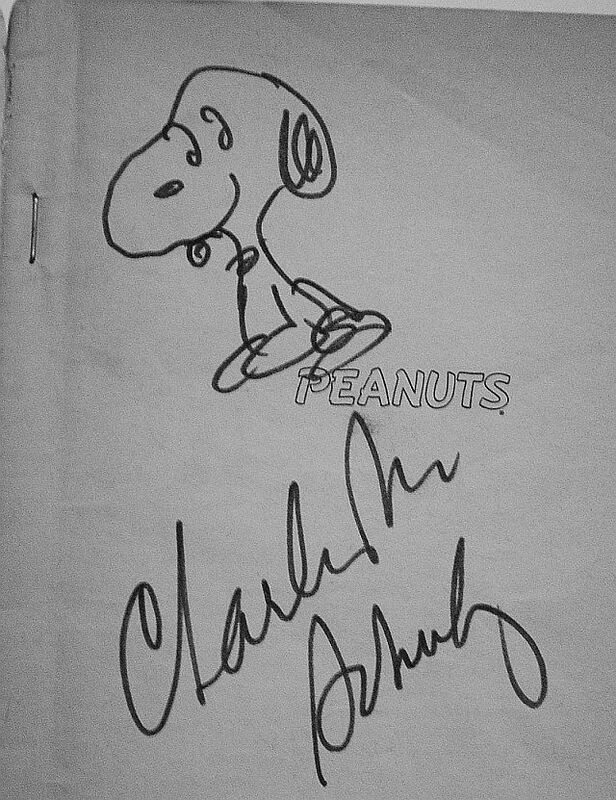 That inscription is on my copy of the first “Peanuts” book (16th printing), which was autographed in 1972 at the San Diego Comic-Con, when they held it at the El Cortez Hotel. I knew Mr. Schulz was going to attend, so I brought my copy of the book with me. Imagine my joy when I saw him striding quickly across the hotel lobby! I ran after him with book in hand, and breathlessly asked him to sign it for me. At first he looked anything but affable, frowning as if I’d caught him in mid-thought. When he saw the book, however, he brightened up. “You know, there aren’t many of these around!”, he said and started to sign it. Before he could make a mark, I piped up: “Can you draw a Snoopy for me?”, Mr. Schulz looked a bit stormy again, but without a word, drew what you see here in about 10 seconds, then handed me the book and walked away so quickly that I don’t know if he heard me say: “Thanks, Mr. Schulz, I’ve loved your work all my life…..” It’s true, I really do love the “Peanuts” strip, and especially Snoopy. My brother and I loved our family dogs, Sparkle and Schatzi when we were little, and Snoopy took the concept of the intimacy of life with the family dog and enlarged it until Schulz had him fighting The Red Baron upon his imaginary Sopwith Camel Doghouse. I like the early long-nosed Snoopy, which evidently Schulz disliked. This version of Snoopy looked especially funny when he was running around frantically chasing rabbits with wide open mouth, at the insistence of Freida, who thought he was getting soft. Schulz and Peanuts created a bit of controversy. It paints a picture of Charles Schulz that is a bit more “fleshed-out” (and I do mean flesh) than his family are comfortable with. Monte Schulz, himself a writer, really took exception to the portrayal of his father as a “hands-off” parent, who let his first wife, Joyce, run the house and discipline the kids, while he turned out the strip. Michaelis also shows us a Charles Schulz uncomfortable with displays of affection with his wife and children, insecure about his talent and the merits of his work, and most revealing of all, a human male who had affairs outside of his marriage(s). Only one of these affairs, with Tracey Claudius, seems to have ended up in bed. Schulz certainly changed from the modest barber’s son, art instructor and God-fearing, St. Paul Minneapolis street corner preacher who didn’t drink and always felt left out of everything in school and personal relationships.I found the chapters from #17, “The Call of California” to #28, “Dailies Done” to be the best part of the book. Charles Schulz, who always thought of himself as unattractive and unimportant, found that as the Peanuts empire grew, his influence (and money) made him irresistible to women. The book (in the chapter “Arena”) goes into quite a lot of detail about Tracey and Schulz, and also gives us insight into how his relationship with his first wife, Joyce, was one of the dynamics that informed the 1960s heyday of the strip. Joyce was really Lucy, to simplify. She was the great builder in the family, building two houses and two studios for “Sparky”, including One Snoopy Place in Santa Rosa, and the Redwood Empire Ice Arena, where Schulz was a denizen of the Warm Puppy Cafe. If you are ever in Santa Rosa, by all means visit the Charles M. Schulz museum and the Ice Rink, I think I love those places more than Disneyland. Eventually, Schulz walked out of his marriage with Joyce, they were in constant conflict over their children, and the affair with Tracey, which Joyce discovered by looking at the Telephone bills. Michaelis draws interesting parallels between happenings in Schulz’s life and the strip, after his marriage to Jeannie in 1973, for instance, Lucy became a much softer character as the inspiration for her feisty attitude, Joyce, lost her influence. Jeannie was much more willing to just let “Sparky” be himself, even indulging his many phobias, such as fear of travel (Jeannie just did a lot of travelling by herself with the children while Sparky stayed in his studio). There were a lot of ironies in Schulz’s life, for all his self-deprecation and low opinion of himself and his work (“I’ll never be Andrew Wyeth”), he was enormously competitive, he felt like Peanuts had to “win” the comics page each day, in comparison with the other strips, or he wasn’t doing his job. He was a very tough negotiator with United Feature Syndicate when he won full rights to the strip, threatening: “…I just want control so you guys can’t ruin it (Peanuts)….I want to own this thing….So either I get my way—exactly what I want—or I’m going to quit.” Wow, that’s no Charlie Brown, that’s Uber-Lucy! What brought this change of heart about? Jim Davis and Garfield! In 1985, Garfield was beginning to be almost as profitable a property to United Feature as Peanuts! Schulz was unhappy with the syndicate’s promotion of the cat at the expense of his dog (Snoopy), so a new era in the business of Peanuts was born. And what a business, at one point in the 1990s, Schulz earned about four thousand dollars a day from his enterprises, not so much the strip, but all the merchandise. Again, I have a very great love for Peanuts, I even tried to make an animated cartoon with the characters when I was nine. My version of Peanuts looked more like a Hanna-Barbera cartoon, with Snoopy doing a spinning leg exit just like Huck Hound. I had a very warm, friendly feeling about the strip in those days, I liked Charlie Brown, and identified with his longing to be liked. I thought Lucy and Schroeder were especially funny together, and of course, Snoopy, that wonderful dog, a friend forever! It’s really the strip that is the true legacy of Charles Schulz. The animated shows were very well done in the early years (especially the old Tennessee Ernie Ford show openings and the Christmas show) and I liked the children’s voices and Guaraldi jazz scores. I hope, however, that the strip will be kept in print always, and that folks will get to know the characters on the printed page. This may be a forlorn hope, because the experience of living with Snoopy day by day, the feeling that he was a living character from the newspaper that fell in the front yard every morning may be impossible to re-create in book reprints where you see many strips all at once. I’m glad Charles Schulz lived on Earth, and gave me (and us) such a wonderful reading experience every day. He did it all himself, too, except he couldn’t finish the lettering in the third panel of the last daily he did (Dec. 31st 1999), Paige Braddock, his office assistant, did the lettering for him from a computer font, because Schulz was not feeling good enough. 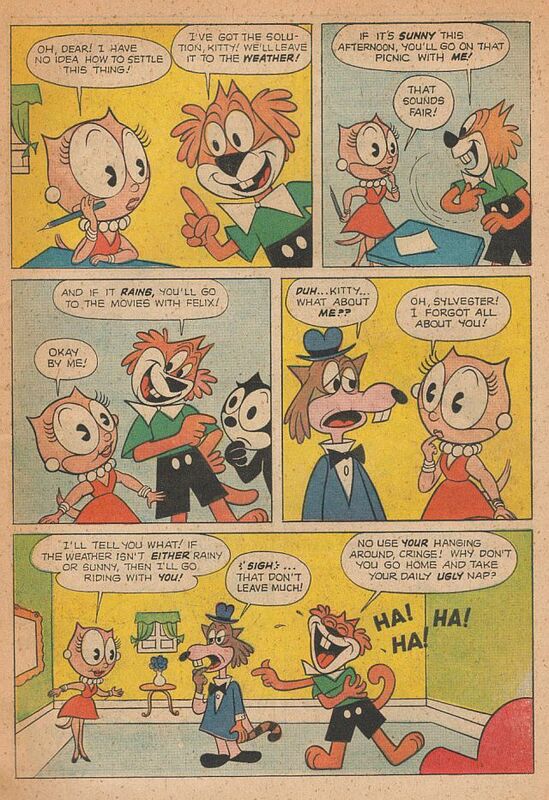 I even love the “Spike and Olaf” era of the strip, when Jeannie’s sanguine influence may have inspired an explosion of new characters. Spike is such a lonely character, living in Needles with only cacti for friends. A lot of Charles Schulz’s feelings of loneliness and isolation are in Spike, and maybe his childhood memories of Needles, California. Michaelis’s book isn’t perfect by any means, he comes to some rather strange conclusions. On page 563, for instance he states “..only after the master was gone could South Park and Family Guy be recognized as ‘a kind of joyous unleashing of the weird, retentive genius of Charles Schulz.’ ” The quotation within the sentence is from Garry Trudeau. I don’t feel comfortable laying such questionable fare as South Park and Family Guy at Schulz’s doorstep. I think he might have been a little uncomfortable with the taste in some of the jokes in those shows. Schulz’s characters might have had their darker moments, but the strip was always something you wouldn’t hesitate to show to your mother or grandmother (both my grandmas loved Peanuts. They both thought that Charlie Brown’s name was “Peanuts”). I wish Michaelis had done a chapter on Schulz’s working methods, what pens he favored, the paper he used, did he have his children pose for him sometimes (they supplied very little of the humor). The details of Charles Schulz’s family life are the real centerpiece of the book, and the strips that Michaelis picked to illustrate some of the incidents, like the strips that allude to his romance with Tracey, are well-chosen and revelatory, though reproduced a bit too small. If Joyce had been reading Peanuts as closely as the telephone bills, maybe she would have known that Sparky was getting romantic about another woman much earlier! If Michaelis had written a more Schulz family-approved book, with more details about the creative side of Peanuts, and less detail about his love life, would the book have been any better? I might have liked it better, but the book is very interesting, and it wouldn’t be as compelling a read (especially in the last third) without Tracey, et. al. This book is obviously written with the adult, general reader in mind who wants to read the darker story behind the strip, whether everything in there is the absolute truth or not. I can’t even say I especially recommend this book, I enjoyed reading it, but my copy of the book was a gift, after all. So READ IT and STOP WHINING, YOU STUPID BEAGLES! This entry was posted on Tuesday, January 29th, 2008 at 2:01 am and is filed under Uncategorized. You can follow any responses to this entry through the RSS 2.0 feed. You can leave a response, or trackback from your own site. Thanks you ver mych for these details and infos. I’ve wanted to know more from a bit of time about this matter. Thanks for your impressions Mark! I’m still in the process of reading the book. So far, it’s a pretty interesting read, but all this negative publicity plus the straight & serious nature of the book is making me feel sadder & sadder for Schulz as I turn each page. I’ve always loved Peanuts. I may not show it very much in my work, but Sparky’s strip was a real influence on me. I really wish I had met him when I had the chance. You’re one of the lucky ones! Oops! I forgot to add this funny story about an original Peanuts strip my friend Frank had (& “lost”) in my first post. Sorry. I work with him at Hofstra U. on Saturdays, teaching young kids cartooning. One day, he thought it would be nice to bring his prized Peanuts strip to show the kids. Suddenly, one of the rambunctious kids grabbed the strip out of his hand, roughly folded it in half, tucked it under his shirt & ran around the room babbling like a lunatic. Frank’s jaw dropped nearly to the floor, he couldv’e cried! I felt so bad, & I think it was a Sunday too!